This Austin covered pool-side cabana is a true backyard paradise. 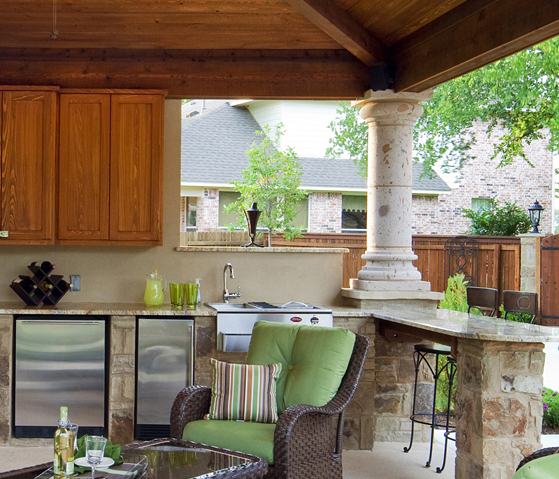 A backyard can hold the key to the ultimate outdoor living enjoyment. A backyard begs to be improved upon, much like an artist’s canvas serves as a backdrop for creativity and visualization. 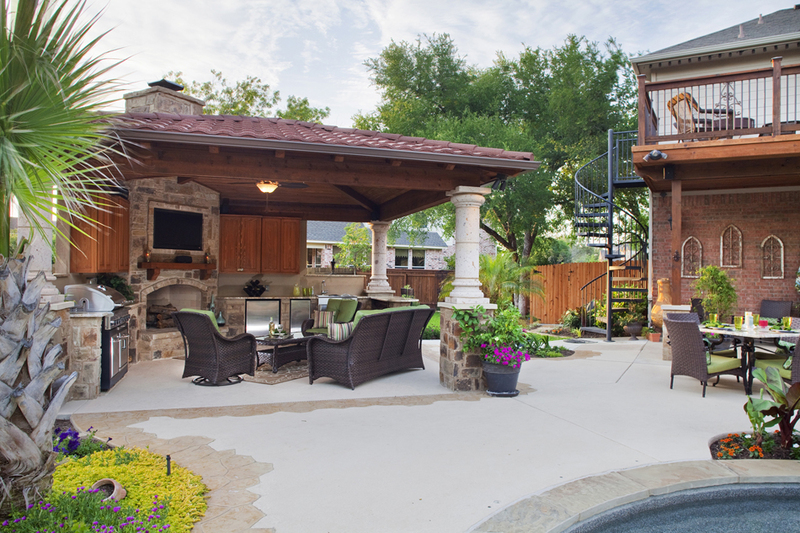 These Austin homeowners took their backyard to a new level by adding a cabana-style covered patio with endless amenities. When we originally met with these Austin, TX homeowners they had recently installed a new pool and had the area adjacent to the pool poured to accommodate a 15 x 15 pavilion. The homeowners had meticulously collected pictures of what they had in mind, but most of the photos were out of scale. We spoke with them about what aspects of the pavilion where the most important and transferred those into the custom design we prepared for them. They already had a nice grill but also wanted an outdoor fireplace, outdoor bar sitting area, outdoor kitchen with refrigerator, ice maker and sink. They also wanted a place to hang a big screen TV to enjoy within the cabana as well. The dilemma was to fit all the elements they wanted into the 15 x 15 design, which couldn’t fit within the space allotted. We strongly urged them to allow pushing the design out two more feet on two of the sides, which would incur the design components to cover all the newly extended concrete. The clients had a stunning brick home that also had an existing wood deck, their pool had a decorative stone back and canterra beams. We designed the structure support with that part of the pool in mind and used cedar to pull the whole thing together. The home, the existing outdoor designs, and the new covered patio blended effortlessly as if they had all been built together. Since the home is located in a weather zone and receives a lot of hail, the roof was also upgraded with steel shingles and a crushed stone application so it looks like clay shingles and is durable and strong. The interior of the cabana boasts custom cypress cabinets which are stair stepped 12″ and 18″. Ingenious design was used to accommodate the TV which required consideration of the placement of the TV as well as the DVD player and cable box, and all the accoutrements that surround the TV. Our cabinet builder customized the TV cabinet and made it deeper to hold all the electronics. We also installed recessed cans for additional lighting in the evening within the covered patio. The existing canterra column lights also aided in night-time illumination. For the bar/serving area we constructed a 6′ bar that can be accessed from either side. This area provides an easily integrated area into the design without becoming a full-blown area to take up too much space. We even installed stucco walls to aid in creating privacy from the neighbors that also hides the children’s playground. Each facet of this cabana’s design allows for flow and easy accessibility. Entering the interior of this pavilion can make every day feel like a weekend. The homeowners are ecstatic with the covered patio design. It has added in their outdoor, and living enjoyment as a whole. Now the family is directed outside to enjoy the area throughout the week instead of just on the weekends. It is the perfect place to have dinner, family movie night, and sleepovers for the kids. They like to spend their time in the covered patio in the evening as a family watching movies or just enjoying each others company by the outdoor fireplace. 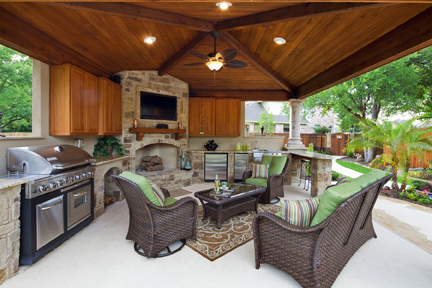 This covered patio is the epitome of an outdoor oasis. This structure is the perfect place for this family to make memories that will last a lifetime, and have a lot of fun in the process! A true work of art in the realm of outdoor living structures. This entry was posted on May 2, 2012 by austinporchandpatio. It was filed under Austin patio cover, Covered patio Austin, Covered Patios, Pool-side Cabanas and was tagged with Archadeck of Austin, Archadeck of Austin design, Austin cabana, Austin covered patio, Austin covered patios, Austin custom covered patios, Austin outdoor fire place, Austin outdoor kitchen, Austin patio builder, Austin pavilions, Austin poolside cabanas.